Protect and preserve Buxton’s unique heritage and landscapes. A huge thank you to Olive Middleton for putting BCA forward for a community award. 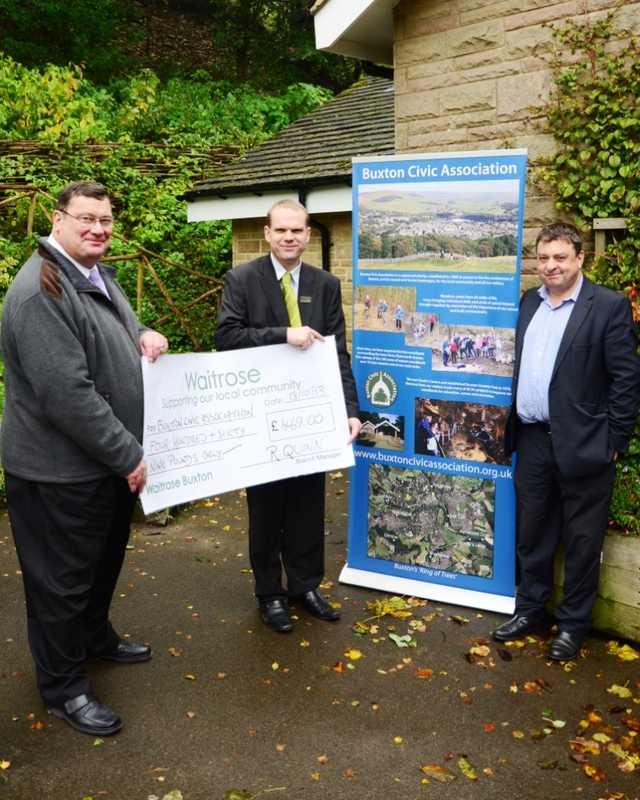 We received almost 50% of the available green tokens and a cheque for £469. Olive was asked by Dan Hopkinson, Manager at Waitrose, to write a few words to help customers to make their community choice and she did us proud. “Buxton Civic Association is a charity that was established in 1968 and its principal role is to protect and preserve Buxton’s unique and wonderful heritage of fine architecture and its natural and formal landscape settings, for the benefit of the local community and visitors to the area. forthcoming retirement to his home city of St David’s. The Association is hugely in his debt for all of the hard graft, inspiration and sound advice that he has contributed in twelve years on the Board. Not only that, but our entire redevelopment programme was largely based on colleagues’ trust in his cool and impartial judgement and his wealth of commercial experience – it would have been difficult to gain approval for the scale of investment required without the confidence which his support inspired in others. Highly regarded on a much broader stage, of course, his Directorship of DDEP and his high level contacts in EMDA certainly didn’t do the Association any harm, either! Over his years on the Board, Bill became adept at sourcing various substantial grants that have been crucial in underpinning the projects that have resulted in our growth and financial stability today. Bill was an obvious choice to undertake our recent Management Review - a task that he carried out with typical efficiency, enthusiasm and professionalism. On a personal level, I too am largely in Bill's debt, for all the years of support and good advice, particularly since I became Chairman. Those exhortations to “keep a cool ‘ead”, to “never let the sun set on your anger”, and, perhaps the most irritating of all, “If you haven’t done it, you haven’t done it”, have, hopefully, made some impression on me – although Bill may sadly regard it as very much a work still in progress!